Azamara Journey Cruise November 10 thru November 20, 2018 Cuba Intensive Miami, Santiago de Cuba (12-13), Grand Cayman (14), Cienfuegos (15-16) and Havana (17-19) We recently completed our first cruise on Azamara on the Journey. It was a 10 day Cuba intensive cruise from Miami going to Santiago de Cuba, Grand Cayman, Cienfuegos and Havana and then back to Miami. The cruise stayed overnight in each of the Cuban ports including 2 nights in Havana. We had booked one of their continental suites, 8068, on deck 8 , which meant we got a variety of included benefits in addition to the regular Azamara benefits. This included unlimited dining in the two specialty restaurants and a 4 bottle bar setup in our room including vodka, rum, gin and scotch. All bottled water is included in your cruise fare which considering Darlene only drinks bottled water on cruises is a really good benefit for us. We flew in a day early to Ft Lauderdale because of the lack of direct flights from St Louis to Miami. We stayed at the Hampton Inn Ft. Lauderdale Airport North Cruise Port. We have stayed numerous times when leaving Florida on cruises. The hotel has a small shopping center next to it so you can pick up any forgotten or just needed articles for the cruise and has always had a clean room and decent breakfast for us to use. This is a good place for people looking for a place to stay either before or after a cruise. If you stay in the area, there is a good Greek restaurant, Mini Pita, in the shopping plaza right next store. They serve wine as well and the food is excellent. We ate a late dinner there the night we flew in so I know they are open until midnight. This meant we had to arrange transportation from the Hampton Inn to Miami the morning of November 10th. I used Wall Street Transportation & Limousine World Wide Company. They sent a Cadillac SUV and driver who arrived on time at 11:15 AM and drove us to the RCL docks in Miami where our ship was. The limo was clean and the driver friendly and I can recommend this company for transportation needs in Miami. After arriving at the port, the process of signing in and getting on the ship was excellent. One we got on the ship, we went to the buffet restaurant on deck 9 for some lunch while the rooms were being made ready. At around 1:30 PM as we were finishing our lunch which included a selection of 2 white and 2 red wines each day, they announced the cabins were ready for occupancy. Generally the wines offered were very good and during the whole cruise we only purchased one extra cost bottle of wine and instead drank the free wine for lunches and dinners. While I don&apos;t consider either my wife or I wine experts or wine snobs I do feel the house wines offered both red and white were perfectly acceptable. We did have one red that we tried that we ended up not drinking but it could have just been a bad bottle. Our continental suite, 8068, was a pleasant surprise. There was plenty of space for 2 of us and the bathroom had a nice walk-in shower. Darlene felt it was a little small but it was perfectly functional and we managed to make it with a single sink for the 10 days we were on the ship. The bed was comfortable but came with 2 feather pillows which we should have exchanged as Darlene is allergic to feathers and dusk, But instead I used those 2 pillows and she used the other two. Our suitcases arrived early enough we got them unpacked and put away before the ship sailed at 5 PM. There was enough space to get everything either hung up, put onto shelves or into drawers and still have some extra drawer space for cameras and other items. We went up to the bar at the stern of the ship for sail away from Miami and got a few pictures of the skyline of Miami as the sun set. Then we attended the meet and greet for cruise critic members who had signed up followed by a cocktail party for frequent cruisers. We are Elite on Celebrity and Diamond of RCL so we were given Discoverer status on Azamara and were invited to the Discover welcome back cocktail party. We had made reservations for several nights of specialty restaurant dining when we first got on the ship as I had read on CC that sometimes they can be hard to get later during the cruise. So we ate dinner the first night in Prime C, the Journey&apos;s steakhouse restaurant. We ate at around 8:30 and had a really nice meal. This was the only night we ordered a bottle of wine rather than just drinking the “free” wines and although it was a decent red, it really wasn&apos;t much better than the daily offerings. We ended up taking the bottle back to our cabin and drinking it there over the next day or so. The next day was a sea day so we slept in a little late and got breakfast in the 9th deck buffet. It was surprisingly not crowded and offered eggs cooked to order as well as a number of items immediately available including fried or scrambled eggs, waffles, pancakes, etc. They also had fruit and cereals. The coffee in the buffet was better than on most ship&apos;s buffets and the orange juice was freshly squeezed. To be honest the day passed quickly. We went to the sit down dining room for lunch and were not really particularly happy with the selection or the service. Since it was only open during sea days for lunch, most of the rest of time we went to the buffet restaurant for lunch and breakfasts. For evening dinner we decided to try the regular dining room and were seated at a table for 8. The service and the food was a mixed bag. Sometimes it seemed the waiters were being asked to service too many tables and when the main courses arrived they were warm rather than hot. Again the offered wines were good and although you had to occasionally remind the server when you needed a refill, there was plenty for everyone. The next morning we would be arriving in our first Cuban port of Santiago de Cuba so we wanted to try to turn in a little early which we did. We had ordered room service for our breakfast so we would be ready for our ship&apos;s tour at beginning at 9:30 AM. We decided to eat on the balcony as the table looked like it was bigger than the one in the cabin. Our butler, Ronald, called at 8 AM to let us know our breakfast was on the way and he arrived with it about 5 minutes later. I had ordered the steak and eggs which arrived hot and cooked correctly. Darlene had an omelet with veggies and cheese. But she ended up getting some of my steak as I couldn&apos;t eat it all. We also had berry bowls and a fruit plate we shared and lots of hot coffee. We had decided on doing ship&apos;s tours in Santiago and in Cienfuergos in order to use up the $700 in cruise credit we had gotten for booking the suite on Azamara. Another reason was that about 2 weeks before the cruise we were notified that instead of docking at Santiago as was originally scheduled we would be tendering in that port. Evidently their cruise port had been damaged by a storm or hurricane a few months before and had not yet been re-certified for use by cruise ships carrying US passengers. By doing a ship&apos;s tour we would be among the first passengers being tendered into the port and would get an early jump on the day&apos;s activities. We went to our tour meeting place in the theater at around 9:25 but evidently people must have started arriving much earlier and we were in the fourth bus going on the fort and city tour we had selected. They had rolls, doughnuts, juice, coffee and tea there for people who had skipped breakfast, which was a nice touch. After a short wait we were led down to the tender deck and boarded our tender for what turned out to be a 20-25 minute tender ride to get to shore. I&apos;m not quite sure why the Captain had been ordered to anchor the ship out as far from shore as he did but it made for a long tender ride. After arriving on shore we had to go through Cuban passport control and then stop to exchange US dollars for Cuban CUC currency. Officially the exchange rate is 1 US to 1 Cuban CUC but they charge an extra 12% fee to exchange US dollars. They only do this will US dollars not other currencies so if you are traveling to Cuba you might want to get a few hundred dollars of Canadian money before going and use it to exchange. We exchanged $350 dollars US and got 308 CUC. They rejected one of our 50 dollar bills because it had a mark on the back side so check any bills you are looking to exchange before planning on using them. Once we had some Cuban currency we then proceeded to our assigned bus. The buses were a pleasant surprise in that they were relatively nice Chinese vehicles with good AC and relatively comfortable seats. The tour we had booked was called "Colonial Santiago" and was a full day tour that included a tour of downtown Santiago, a stop at San Juan hill where Teddy Roosevelt and his rough riders fought a battle, a visit to colonial era fort, lunch, and a musical dance program by Cuban musicians. Our guide was a Cuban woman who spoke good English and tried to answer any questions we had. The port we had been taken to seemed to be in a mainly commercial area and our first drive was to the main square in Santiago where their cathedral was. There is also a large public building where Castro gave one of his early speeches declaring his rebellion against Batista. Also off this square is one of the oldest surviving houses which was built in 1545. We also then walked through a shopping area used by the locals and the guide pointed the 2 types of stores, government owned and private owned. Next we boarded the bus for a trip to San Juan hill for a short visit. This was made famous by Teddy Roosevelt and his rough riders during the Spanish American War or as the Cubans call it the second Cuban War of Independence. Here there were statues, cannons and a reconstructed blockhouse. We re-boarded the bus for the drive out to the fort which was on a peninsula on one side of the bay from where Santiago sits which took us about an hour or so. Let me mention here that it was hot the day we were there, above 90 degrees and although the bus&apos;s AC worked well most of the places we visited didn&apos;t have much shade or any AC which made the day one you needed to drink a lot of water. Arriving at the fort we had to walk up numerous levels of steps to get up to the main gate of the fort. The fort was placed at a narrow entry to the bay on which Santiago sits. Pirates had used the bay as a place to get fresh water from the streams that flow into it and also to restock their ships with other provisions prior to the Spanish building the fort here. Castillo del Morro San Pedro De La Roca was begun in 1619 and was continually expanded and worked on right up into the mid 1800&apos;s. The views from its battlements were really spectacular and it is hard to believe that the fort was taken by pirates several times given its position and how difficult it must have been. The interior of the fort contained a chapel where the guide told us of the legend of the white lady. Evidently the wife of one of the commanders of the fort is supposed to haunt the fort looking for her husband who never returned from an expedition to Florida. We didn&apos;t see her but we were not there at night or in the early morning when she is supposed to appear. There was a small museum with items found in the fort and weapons from the time the fort was used. But the fort required climbing up and down a lot of steps and most of it was in the direct sunshine so it was hot. Darlene decided with several other tour members to leave the fort early and go down to the restaurant where we would be having our lunch. When I arrived at the restaurant, she had saved me a seat and they served us Cuba Libre drinks, rum and coke basically. Then also gave us Cuban beer and bottled water. The food was served family style and was a variety of small portions of chicken, pork, fish, beans, rice and fried plantains as well as Cuban bread, This was followed by some cake and ice cream as well as Cuban coffee but no decafe coffee. The food was all right but not great and the restaurant was not air conditioned but even if it did have ceiling fans, it was still hot. There were a number of souvenir stands along the walkway back to the bus and we ended up buying a wood carving that according to the artist is a symbol of the male and female. I think we paid 20 CUC for it and the guy who sold it said it took him 4 days to carve. Our last stop was back in Santiago where we were to attend a Cuban dance presentation by a group of Cuban dancers and singers who have traveled around the world putting on their performances. It was interesting but might have been more so if I understood Spanish. We arrived back at the tender port around 4:00 PM and were able to board a tender relatively rapidly. The trip back to the ship was uneventful but just as long as the morning ride in had been. We had looked at a different excursion at this port which went to the city of Trinidad which is supposed to be a world heritage site. We decided on the tour we did because we worried about the length of the bus ride. Once back on the ship we talked with several couples who we had met the first couple of days on the cruise who did that tour and who were very critical of the length of the bus ride, they said it took almost 2 hours to get there and another 2 hours back with basically boring scenery the whole trip. They also said the lunch wasn&apos;t particularly good and that all in all it was a trip they would have just as soon not taken. The Journey stayed in the bay until around 6 AM in the morning and then sailed for the Caymans giving us what amounted to our second sea day. We decided to try the dining room for a sit down breakfast which we often do on sea days when on a cruise. The whole experience re-enforced our first impression of the main dining room. Again the service and the food was a mixed bag. We had arrived towards the end of the serving period and the restaurant was only partially occupied. We said at a table for two but it was arranged close to 2 other tables for 2 on either side both which were occupied when we arrived. One was just getting their coffee and the other looked like they were in the middle of their main breakfast meal. We got menus when we say down but it took a few minutes for someone to come back to ask about coffee and juice. We were surprised to find the menu here wasn&apos;t much different from the suite breakfast menu for room service. Darlene ordered the steak and eggs like I had the day before and I got waffles since that isn&apos;t something we fix at home. It took awhile for the food to arrive and when it did the steak was prepared correctly but was significantly smaller than the one I had gotten from room service. Getting coffee refills became a matter of watching for waiters and signaling them to come over rather than having them come by and offer to refill our cups. By the end of the meal we had decided to skip future breakfasts in the dining room and either do room service or the upstairs buffet. Grand Cayman is always a tender port and since I had left my extra batteries and charger for one of my cameras at home by mistake, I wanted to go to a camera store and get a charger and possibly an extra battery so around 11 or so we headed down to the tender deck and rode into Grand Cayman. This time the tender ride was only a few minutes as we were anchored much closer with the 3 or 4 other bigger ships there with us anchored out further. I found a tourist map which had one camera store listed “Cathy&apos;s Cameras” which was on the main road that runs along the shore. It was located in the lobby of the Sunset House Hotel. Assuming it couldn&apos;t be too far a walk we began walking down the sidewalk and just kept walking for what seemed to be forever. Had I known how far it was I would have gotten a taxi but once we were over half way there and in spite of the heat, there didn&apos;t seem to be anyway to get a taxi to take us the last half. To make things worse, I was looking for a battery and battery charger for a Canon camera. It turns out Cathy&apos;s Cameras doesn&apos;t carry any Canon products at all and according to them no one in the Caymans carries Canon products. They did have a generic charger that looked like it would work with the battery in my camera so I spent $45 for it. Unfortunately when I got it back to the ship I got it to work once and then when I tried to use it the second time it failed to recharge my battery at all. So all and all the whole trip was a waster of time, money and energy. We were able to get a taxi back to town and then went shopping for some ribbon or shoe strings that Darlene could use to keep her hat from blowing off her head. We ended up finding some shoe laces in a drug store and decided to head back to the ship for a late lunch. We luckily caught a tender quickly and were back in time to do the buffet lunch upstairs. My plan in the afternoon had been to go to the Sanctuary where they had a hot tub and sauna but instead we decided to do some laundry in the free laundromat on deck 7. They give you the soap for free and the machines which looked relatively new were also for free. We ended up doing 2 loads which took up the rest of the afternoon. That night we went to the other specialty restaurant called Aqualina which is Italian influenced cusine. In Cienfuegas we booked the ship&apos;s "Nuestra Senora de Jagua" tour. Explore the history and culture of Cienfuegos on this journey to the Fortress of Nuestra Señora de Jagua, followed by a scenic drive and a walk down the Santa Isabel Boulevard. Your journey begins with a visit to the Fortress of Nuestra Señora de Jagua, located at the entrance to Cienfuegos&apos;s beautiful bay. Learn about the city&apos;s rich maritime traditions and the history of this fort, founded in 1745. Nuestra Señora de Jagua is the only Spanish military fortress constructed in the late eighteenth century Renaissance style. After lunch at a local restaurant, enjoy a panoramic drive through the heart of Cienfuegos. Then, it&apos;s off to the Teatro Tomas Terry, a magnificent opera house and theatre that seats 950. Marvel at sumptuous Carrara marble and hand-carved Cuban hardwood decorations. Finally, explore the bustling Santa Isabel Boulevard before returning to the ship. We arranged for 2 days of tours with Fer 2 Havana tours originally and then had to alter our arrangements because Azamara changed their schedule and Fernando was very good at changing our 2 days to 3 days at the same price. We did an evening when the ship arrived and met our guide, Javier (Pepe), met us in the square directly across from the ship at 7 PM. He then changed plans as we had already eaten on the ship and we went to the Hotel National for a drink which has been in Havana forever and has been where all the famous and infamous people stayed. We had very good rum drinks there and enjoyed the ambiance before going on the cannon firing at the fort in a vintage 53 Pontiac hardtop with A/C and then to the Buena Vista Social Club.where we stayed for drinks and listening to the Cuban music. For the cover charge which I think was 30 CUC each we got 3 drinks each. I got Cuba Libre and Darlene had a beer and 2 bottled waters. The music was loud and we left after about an hour and 45 minutes. Our driver had waited for us and drove us back to the ship. The next morning at 10 AM we met Javier again in the square and we did a walking tour of the four main squares of old Havana for about 2 1/2 hours, Then we had lunch at a really private restaurant that was a little expensive 80 CUC for the 2 of us with one glass of wine each. We both got a seafood dish with lobster, shrimp, fish and rice and veggies. We also each got a desert. The restaurant was totally full but many of the people there were from either other Fer Tours or other guides. Javier then met us outside and we walked to where we met our driver for the rest of the day in his 1956 red Chevy convertible. The car wasn&apos;t his but the owner had gotten too old to drive so he hired him to take care of the car and drive it. We had the car for 3 hours and saw a lot of Havana with an informative driver. He left us off at the ship at 4:30. Finally the next morning, our ship was in Havana for 3 days, Javier again met us in the square at 9 AM and we got in another old Chevy hardtop with A/C and went to Hemmingway&apos;s house, followed by a visit to the town where he kept the Pilar and his favorite bar there. Then we came back to Havana and went to Fusterland. This is an area of Havana an artist began decorating with mosaics and painting and included a visit to his house. If you have been to Barcelona and see Guidi&apos;s village there this is similar but maybe more colorful and tropical. Our ship was sailing at 3 PM so Javier and the driver dropped us off at 2 PM by the ship. These were great tours with a great guide, Javier, who is a psychologist in real life. The cost for the 3 days was $480 US which was a fraction of what similar tours thru the ship would have cost. If you are going to Havana give Fer Tours a chance to give you a great time in Havana. The last night after finishing packing we went to a Chef&apos;s dinner in Prime C. It was labeled Cuban night and had a variety of Cuban influenced foods prepared by the chef each matched with good wines. There were 5 couples there including us. Several had gotten a free Chef&apos;s dinner in a promotion that some cruise agencies were running for people who booked suites. Unfortunately we paid for ours. The food and company was good. It was hosted by the ship&apos;s young environmental officer who was from Serbia or Croatia, I can&apos;t remember. But he spoke good English and was a personable young man. We only saw the Chef at the first of the meal. The wines and courses were announced by the head sommelier. All in all we enjoyed our cruise and especially getting a chance to visit Cuba. It is a friendly and welcoming country that unfortunately is badly in need of a lot of infrastructure repair. The long USA embargo and the loss of help from the USSR when it fell shows. The old cars in Havana especially were interesting and fun to see. It is amazing how they have managed to keep them running. Our tour guide in Havana, Javier (Pepe), did a great job and we left him with a good tip at the end of the last tour. I hope someday he gets to travel to the USA where he has a sister living in Florida. One of the things we learned from him is how most Cubans his age are still living with parents and in many cases grandparents all in one home. That was the case with him and with the driver of the convertible we were with for 3 hours. He said it was the most common and only way they could afford to live at all. The average wage for a Cuban worker is $30 a month with a few highly skilled doctors or higher governmental officials making more. Given there is no such thing as a home loan, if you can find a home for sale, you have to pay cash which few Cubans can possibly do. Well this is long enough for now. Azamara is a cruise line that we will be looking at for future cruises as we enjoyed the friendly and helpful crew and the ship&apos;s size as well as the complimentary wine and cocktails. Have a great next cruise. Us in front of our 53 Chevy convertible. We recently completed our first cruise on Azamara on the Journey. It was a 10 day Cuba intensive cruise from Miami going to Santiago de Cuba, Grand Cayman, Cienfuegos and Havana and then back to Miami. The cruise stayed overnight in each of the Cuban ports including 2 nights in Havana. We had booked one of their continental suites, 8068, on deck 8 , which meant we got a variety of included benefits in addition to the regular Azamara benefits. This included unlimited dining in the two specialty restaurants and a 4 bottle bar setup in our room including vodka, rum, gin and scotch. All bottled water is included in your cruise fare which considering Darlene only drinks bottled water on cruises is a really good benefit for us. We flew in a day early to Ft Lauderdale because of the lack of direct flights from St Louis to Miami. We stayed at the Hampton Inn Ft. Lauderdale Airport North Cruise Port. We have stayed numerous times when leaving Florida on cruises. The hotel has a small shopping center next to it so you can pick up any forgotten or just needed articles for the cruise and has always had a clean room and decent breakfast for us to use. This is a good place for people looking for a place to stay either before or after a cruise. If you stay in the area, there is a good Greek restaurant, Mini Pita, in the shopping plaza right next store. They serve wine as well and the food is excellent. We ate a late dinner there the night we flew in so I know they are open until midnight. This meant we had to arrange transportation from the Hampton Inn to Miami the morning of November 10th. I used Wall Street Transportation & Limousine World Wide Company. They sent a Cadillac SUV and driver who arrived on time at 11:15 AM and drove us to the RCL docks in Miami where our ship was. The limo was clean and the driver friendly and I can recommend this company for transportation needs in Miami. After arriving at the port, the process of signing in and getting on the ship was excellent. One we got on the ship, we went to the buffet restaurant on deck 9 for some lunch while the rooms were being made ready. At around 1:30 PM as we were finishing our lunch which included a selection of 2 white and 2 red wines each day, they announced the cabins were ready for occupancy. Generally the wines offered were very good and during the whole cruise we only purchased one extra cost bottle of wine and instead drank the free wine for lunches and dinners. While I don&apos;t consider either my wife or I wine experts or wine snobs I do feel the house wines offered both red and white were perfectly acceptable. We did have one red that we tried that we ended up not drinking but it could have just been a bad bottle. Our continental suite, 8068, was a pleasant surprise. There was plenty of space for 2 of us and the bathroom had a nice walk-in shower. Darlene felt it was a little small but it was perfectly functional and we managed to make it with a single sink for the 10 days we were on the ship. The bed was comfortable but came with 2 feather pillows which we should have exchanged as Darlene is allergic to feathers and dusk, But instead I used those 2 pillows and she used the other two. Our suitcases arrived early enough we got them unpacked and put away before the ship sailed at 5 PM. There was enough space to get everything either hung up, put onto shelves or into drawers and still have some extra drawer space for cameras and other items. We went up to the bar at the stern of the ship for sail away from Miami and got a few pictures of the skyline of Miami as the sun set. Then we attended the meet and greet for cruise critic members who had signed up followed by a cocktail party for frequent cruisers. We are Elite on Celebrity and Diamond of RCL so we were given Discoverer status on Azamara and were invited to the Discover welcome back cocktail party. We had made reservations for several nights of specialty restaurant dining when we first got on the ship as I had read on CC that sometimes they can be hard to get later during the cruise. So we ate dinner the first night in Prime C, the Journey&apos;s steakhouse restaurant. We ate at around 8:30 and had a really nice meal. This was the only night we ordered a bottle of wine rather than just drinking the “free” wines and although it was a decent red, it really wasn&apos;t much better than the daily offerings. We ended up taking the bottle back to our cabin and drinking it there over the next day or so. The next day was a sea day so we slept in a little late and got breakfast in the 9th deck buffet. It was surprisingly not crowded and offered eggs cooked to order as well as a number of items immediately available including fried or scrambled eggs, waffles, pancakes, etc. They also had fruit and cereals. The coffee in the buffet was better than on most ship&apos;s buffets and the orange juice was freshly squeezed. To be honest the day passed quickly. We went to the sit down dining room for lunch and were not really particularly happy with the selection or the service. Since it was only open during sea days for lunch, most of the rest of time we went to the buffet restaurant for lunch and breakfasts. For evening dinner we decided to try the regular dining room and were seated at a table for 8. The service and the food was a mixed bag. Sometimes it seemed the waiters were being asked to service too many tables and when the main courses arrived they were warm rather than hot. Again the offered wines were good and although you had to occasionally remind the server when you needed a refill, there was plenty for everyone. The next morning we would be arriving in our first Cuban port of Santiago de Cuba so we wanted to try to turn in a little early which we did. We had ordered room service for our breakfast so we would be ready for our ship&apos;s tour at beginning at 9:30 AM. We decided to eat on the balcony as the table looked like it was bigger than the one in the cabin. Our butler, Ronald, called at 8 AM to let us know our breakfast was on the way and he arrived with it about 5 minutes later. I had ordered the steak and eggs which arrived hot and cooked correctly. Darlene had an omelet with veggies and cheese. But she ended up getting some of my steak as I couldn&apos;t eat it all. We also had berry bowls and a fruit plate we shared and lots of hot coffee. We had decided on doing ship&apos;s tours in Santiago and in Cienfuergos in order to use up the $700 in cruise credit we had gotten for booking the suite on Azamara. Another reason was that about 2 weeks before the cruise we were notified that instead of docking at Santiago as was originally scheduled we would be tendering in that port. Evidently their cruise port had been damaged by a storm or hurricane a few months before and had not yet been re-certified for use by cruise ships carrying US passengers. By doing a ship&apos;s tour we would be among the first passengers being tendered into the port and would get an early jump on the day&apos;s activities. We went to our tour meeting place in the theater at around 9:25 but evidently people must have started arriving much earlier and we were in the fourth bus going on the fort and city tour we had selected. They had rolls, doughnuts, juice, coffee and tea there for people who had skipped breakfast, which was a nice touch. After a short wait we were led down to the tender deck and boarded our tender for what turned out to be a 20-25 minute tender ride to get to shore. I&apos;m not quite sure why the Captain had been ordered to anchor the ship out as far from shore as he did but it made for a long tender ride. After arriving on shore we had to go through Cuban passport control and then stop to exchange US dollars for Cuban CUC currency. Officially the exchange rate is 1 US to 1 Cuban CUC but they charge an extra 12% fee to exchange US dollars. They only do this will US dollars not other currencies so if you are traveling to Cuba you might want to get a few hundred dollars of Canadian money before going and use it to exchange. We exchanged $350 dollars US and got 308 CUC. They rejected one of our 50 dollar bills because it had a mark on the back side so check any bills you are looking to exchange before planning on using them. Once we had some Cuban currency we then proceeded to our assigned bus. The buses were a pleasant surprise in that they were relatively nice Chinese vehicles with good AC and relatively comfortable seats. The tour we had booked was called "Colonial Santiago" and was a full day tour that included a tour of downtown Santiago, a stop at San Juan hill where Teddy Roosevelt and his rough riders fought a battle, a visit to colonial era fort, lunch, and a musical dance program by Cuban musicians. Our guide was a Cuban woman who spoke good English and tried to answer any questions we had. The port we had been taken to seemed to be in a mainly commercial area and our first drive was to the main square in Santiago where their cathedral was. There is also a large public building where Castro gave one of his early speeches declaring his rebellion against Batista. Also off this square is one of the oldest surviving houses which was built in 1545. We also then walked through a shopping area used by the locals and the guide pointed the 2 types of stores, government owned and private owned. Next we boarded the bus for a trip to San Juan hill for a short visit. This was made famous by Teddy Roosevelt and his rough riders during the Spanish American War or as the Cubans call it the second Cuban War of Independence. Here there were statues, cannons and a reconstructed blockhouse. We re-boarded the bus for the drive out to the fort which was on a peninsula on one side of the bay from where Santiago sits which took us about an hour or so. Let me mention here that it was hot the day we were there, above 90 degrees and although the bus&apos;s AC worked well most of the places we visited didn&apos;t have much shade or any AC which made the day one you needed to drink a lot of water. Arriving at the fort we had to walk up numerous levels of steps to get up to the main gate of the fort. The fort was placed at a narrow entry to the bay on which Santiago sits. Pirates had used the bay as a place to get fresh water from the streams that flow into it and also to restock their ships with other provisions prior to the Spanish building the fort here. Castillo del Morro San Pedro De La Roca was begun in 1619 and was continually expanded and worked on right up into the mid 1800&apos;s. The views from its battlements were really spectacular and it is hard to believe that the fort was taken by pirates several times given its position and how difficult it must have been. The interior of the fort contained a chapel where the guide told us of the legend of the white lady. Evidently the wife of one of the commanders of the fort is supposed to haunt the fort looking for her husband who never returned from an expedition to Florida. We didn&apos;t see her but we were not there at night or in the early morning when she is supposed to appear. There was a small museum with items found in the fort and weapons from the time the fort was used. But the fort required climbing up and down a lot of steps and most of it was in the direct sunshine so it was hot. Darlene decided with several other tour members to leave the fort early and go down to the restaurant where we would be having our lunch. When I arrived at the restaurant, she had saved me a seat and they served us Cuba Libre drinks, rum and coke basically. Then also gave us Cuban beer and bottled water. The food was served family style and was a variety of small portions of chicken, pork, fish, beans, rice and fried plantains as well as Cuban bread, This was followed by some cake and ice cream as well as Cuban coffee but no decafe coffee. The food was all right but not great and the restaurant was not air conditioned but even if it did have ceiling fans, it was still hot. There were a number of souvenir stands along the walkway back to the bus and we ended up buying a wood carving that according to the artist is a symbol of the male and female. I think we paid 20 CUC for it and the guy who sold it said it took him 4 days to carve. Our last stop was back in Santiago where we were to attend a Cuban dance presentation by a group of Cuban dancers and singers who have traveled around the world putting on their performances. It was interesting but might have been more so if I understood Spanish. We arrived back at the tender port around 4:00 PM and were able to board a tender relatively rapidly. The trip back to the ship was uneventful but just as long as the morning ride in had been. We had looked at a different excursion at this port which went to the city of Trinidad which is supposed to be a world heritage site. We decided on the tour we did because we worried about the length of the bus ride. Once back on the ship we talked with several couples who we had met the first couple of days on the cruise who did that tour and who were very critical of the length of the bus ride, they said it took almost 2 hours to get there and another 2 hours back with basically boring scenery the whole trip. They also said the lunch wasn&apos;t particularly good and that all in all it was a trip they would have just as soon not taken. The Journey stayed in the bay until around 6 AM in the morning and then sailed for the Caymans giving us what amounted to our second sea day. We decided to try the dining room for a sit down breakfast which we often do on sea days when on a cruise. The whole experience re-enforced our first impression of the main dining room. Again the service and the food was a mixed bag. We had arrived towards the end of the serving period and the restaurant was only partially occupied. We said at a table for two but it was arranged close to 2 other tables for 2 on either side both which were occupied when we arrived. One was just getting their coffee and the other looked like they were in the middle of their main breakfast meal. We got menus when we say down but it took a few minutes for someone to come back to ask about coffee and juice. We were surprised to find the menu here wasn&apos;t much different from the suite breakfast menu for room service. Darlene ordered the steak and eggs like I had the day before and I got waffles since that isn&apos;t something we fix at home. It took awhile for the food to arrive and when it did the steak was prepared correctly but was significantly smaller than the one I had gotten from room service. Getting coffee refills became a matter of watching for waiters and signaling them to come over rather than having them come by and offer to refill our cups. By the end of the meal we had decided to skip future breakfasts in the dining room and either do room service or the upstairs buffet. Grand Cayman is always a tender port and since I had left my extra batteries and charger for one of my cameras at home by mistake, I wanted to go to a camera store and get a charger and possibly an extra battery so around 11 or so we headed down to the tender deck and rode into Grand Cayman. This time the tender ride was only a few minutes as we were anchored much closer with the 3 or 4 other bigger ships there with us anchored out further. I found a tourist map which had one camera store listed “Cathy&apos;s Cameras” which was on the main road that runs along the shore. It was located in the lobby of the Sunset House Hotel. Assuming it couldn&apos;t be too far a walk we began walking down the sidewalk and just kept walking for what seemed to be forever. Had I known how far it was I would have gotten a taxi but once we were over half way there and in spite of the heat, there didn&apos;t seem to be anyway to get a taxi to take us the last half. To make things worse, I was looking for a battery and battery charger for a Canon camera. It turns out Cathy&apos;s Cameras doesn&apos;t carry any Canon products at all and according to them no one in the Caymans carries Canon products. They did have a generic charger that looked like it would work with the battery in my camera so I spent $45 for it. Unfortunately when I got it back to the ship I got it to work once and then when I tried to use it the second time it failed to recharge my battery at all. So all and all the whole trip was a waster of time, money and energy. We were able to get a taxi back to town and then went shopping for some ribbon or shoe strings that Darlene could use to keep her hat from blowing off her head. We ended up finding some shoe laces in a drug store and decided to head back to the ship for a late lunch. We luckily caught a tender quickly and were back in time to do the buffet lunch upstairs. My plan in the afternoon had been to go to the Sanctuary where they had a hot tub and sauna but instead we decided to do some laundry in the free laundromat on deck 7. They give you the soap for free and the machines which looked relatively new were also for free. We ended up doing 2 loads which took up the rest of the afternoon. That night we went to the other specialty restaurant called Aqualina which is Italian influenced cusine. In Cienfuegas we booked the ship&apos;s "Nuestra Senora de Jagua" tour. Explore the history and culture of Cienfuegos on this journey to the Fortress of Nuestra Señora de Jagua, followed by a scenic drive and a walk down the Santa Isabel Boulevard. Your journey begins with a visit to the Fortress of Nuestra Señora de Jagua, located at the entrance to Cienfuegos&apos;s beautiful bay. Learn about the city&apos;s rich maritime traditions and the history of this fort, founded in 1745. Nuestra Señora de Jagua is the only Spanish military fortress constructed in the late eighteenth century Renaissance style. After lunch at a local restaurant, enjoy a panoramic drive through the heart of Cienfuegos. Then, it&apos;s off to the Teatro Tomas Terry, a magnificent opera house and theatre that seats 950. Marvel at sumptuous Carrara marble and hand-carved Cuban hardwood decorations. Finally, explore the bustling Santa Isabel Boulevard before returning to the ship. 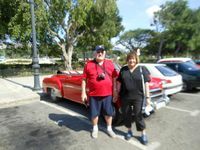 We arranged for 2 days of tours with Fer 2 Havana tours originally and then had to alter our arrangements because Azamara changed their schedule and Fernando was very good at changing our 2 days to 3 days at the same price. We did an evening when the ship arrived and met our guide, Javier (Pepe), met us in the square directly across from the ship at 7 PM. He then changed plans as we had already eaten on the ship and we went to the Hotel National for a drink which has been in Havana forever and has been where all the famous and infamous people stayed. We had very good rum drinks there and enjoyed the ambiance before going on the cannon firing at the fort in a vintage 53 Pontiac hardtop with A/C and then to the Buena Vista Social Club.where we stayed for drinks and listening to the Cuban music. For the cover charge which I think was 30 CUC each we got 3 drinks each. I got Cuba Libre and Darlene had a beer and 2 bottled waters. The music was loud and we left after about an hour and 45 minutes. Our driver had waited for us and drove us back to the ship. The next morning at 10 AM we met Javier again in the square and we did a walking tour of the four main squares of old Havana for about 2 1/2 hours, Then we had lunch at a really private restaurant that was a little expensive 80 CUC for the 2 of us with one glass of wine each. We both got a seafood dish with lobster, shrimp, fish and rice and veggies. We also each got a desert. The restaurant was totally full but many of the people there were from either other Fer Tours or other guides. Javier then met us outside and we walked to where we met our driver for the rest of the day in his 1956 red Chevy convertible. The car wasn&apos;t his but the owner had gotten too old to drive so he hired him to take care of the car and drive it. We had the car for 3 hours and saw a lot of Havana with an informative driver. He left us off at the ship at 4:30. Finally the next morning, our ship was in Havana for 3 days, Javier again met us in the square at 9 AM and we got in another old Chevy hardtop with A/C and went to Hemmingway&apos;s house, followed by a visit to the town where he kept the Pilar and his favorite bar there. Then we came back to Havana and went to Fusterland. This is an area of Havana an artist began decorating with mosaics and painting and included a visit to his house. If you have been to Barcelona and see Guidi&apos;s village there this is similar but maybe more colorful and tropical. Our ship was sailing at 3 PM so Javier and the driver dropped us off at 2 PM by the ship. These were great tours with a great guide, Javier, who is a psychologist in real life. The cost for the 3 days was $480 US which was a fraction of what similar tours thru the ship would have cost. If you are going to Havana give Fer Tours a chance to give you a great time in Havana. The last night after finishing packing we went to a Chef&apos;s dinner in Prime C. It was labeled Cuban night and had a variety of Cuban influenced foods prepared by the chef each matched with good wines. There were 5 couples there including us. Several had gotten a free Chef&apos;s dinner in a promotion that some cruise agencies were running for people who booked suites. Unfortunately we paid for ours. The food and company was good. It was hosted by the ship&apos;s young environmental officer who was from Serbia or Croatia, I can&apos;t remember. But he spoke good English and was a personable young man. We only saw the Chef at the first of the meal. The wines and courses were announced by the head sommelier. All in all we enjoyed our cruise and especially getting a chance to visit Cuba. It is a friendly and welcoming country that unfortunately is badly in need of a lot of infrastructure repair. The long USA embargo and the loss of help from the USSR when it fell shows. The old cars in Havana especially were interesting and fun to see. It is amazing how they have managed to keep them running. Our tour guide in Havana, Javier (Pepe), did a great job and we left him with a good tip at the end of the last tour. I hope someday he gets to travel to the USA where he has a sister living in Florida. One of the things we learned from him is how most Cubans his age are still living with parents and in many cases grandparents all in one home. That was the case with him and with the driver of the convertible we were with for 3 hours. He said it was the most common and only way they could afford to live at all. The average wage for a Cuban worker is $30 a month with a few highly skilled doctors or higher governmental officials making more. Given there is no such thing as a home loan, if you can find a home for sale, you have to pay cash which few Cubans can possibly do. Well this is long enough for now. Azamara is a cruise line that we will be looking at for future cruises as we enjoyed the friendly and helpful crew and the ship&apos;s size as well as the complimentary wine and cocktails. The cabin was spacious and in good shape. The bathroom had been remodeled to include a walk-in shower which was a plus. My only complaint was the water in the shower never got above slightly warm. The bathroom is on the small size with only a single sink but is fine as long as only one person at a time needs to use it. The bed was comfortable and there was plenty of storage, drawers, shelves and hanging space for everything we brought (and my wife always makes sure she has enough for the 10 days and more). They give you 2 feather pillows and 2 other pillows so if you are allergic to feathers ask your butler to exchange them the first day. The room service menu for breakfast especially was great and we used it several times. It always arrived on time and with everything hot. My one other complaint is the location of the electrical outlets which are on the side of the dressing table /desk. They were hard to get to and there were not enough of them. They did have one USB outlet on each side of the bed which we both used to charge Iphones, Ipads and kindles. Good tour by Javier of Fer Tours. See my reviews for details.